Now you can enjoy the flavor of the holidays every day throughout the year with our Pumpkin Spice Matcha Green Tea Latte blend. The star ingredient along with Matcha tea in this blend is "Lucuma", an amazing Peruvian Superfruit that is tastier and more nutritious compared to pumpkin with an ancient history. When we create a Matcha latte blend our goal is to not only provide delicious flavors infused with Matcha tea but we also research every ingredient to find the perfect blends of health-promoting superfoods that can actually enhance the effects and matcha benefits. Matcha is already an amazing superfood but now it is combined with another ancient superfood; Lucuma. Lucuma is a traditional fruit from Peru referred to as "The Gold of the Incas". Ancient pottery has been found made by the Incans with Lucuma fruit painted on them showing how revered it was centuries ago. This amazing nutritious fruit can be found at almost every store and eatery in Peru, it truly is still a staple. Lucuma is very low in sugars, making it a great choice for those trying to watch their blood sugar levels. Lucuma is rich in vitamins and minerals including iron, beta-carotene, calcium and niacin. Lucuma is rich in flavor capturing the tastes of pumpkin and caramel – it is truly delicious and unique. We like to think of it like the Peruvian pumpkin but even more nutrient dense and sweeter which is why it was the perfect choice for our "pumpkin" tea blend. Lucuma is most commonly used in the dried powder form, traditionally added to desserts such as ice cream and now we have brought it to you in the form of tea. One tablespoon of Lucuma is only about 50 calories, 0 grams of fat, 1 gram of sugar and 1 gram of protein. This fruit is powerful in taste but easy to digest and light on the waistline. For those with diabetes and/or trying to manage their weight, Matcha and Lucuma are two superfoods that specifically work together to balance your blood sugar levels and can even help prevent diabetes. 1. We take a tall mug of hot or boiling 12-16 ounces – 1/4 filtered water and 3/4 almond milk or milk of choice. 2. 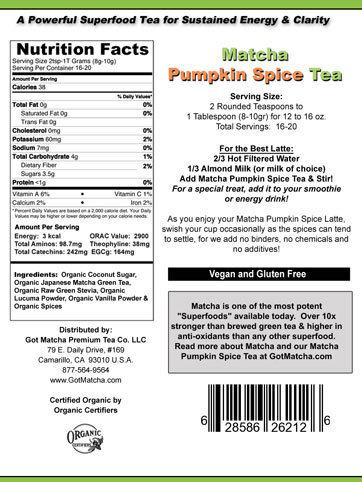 We add 1 tablespoon of the Matcha Pumpkin Spice and stir. 3. 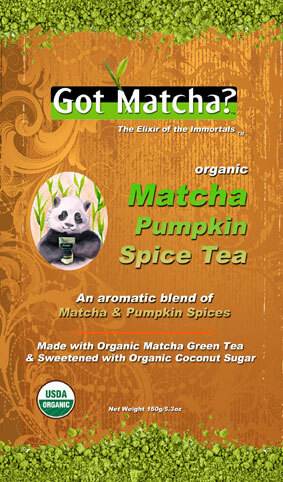 It is also delicious as an iced pumkin spice latte or when added to a matcha green tea smoothie! That is all there is to it! Simple, quick and tasty. Where the Matcha can tend to clump a bit when mixing, with our Matcha Pumpkin Spice, the spices and the Coconut Sugar act as a perfect blending agent, so you have no problems with clumping.